Numbers matching, 4 speed manual transmission, L82/350 motor, 83,000 miles on dash, original black leather interior, alloy wheels, AM/FM Delco radio, A/C, Gymkhana suspension, sport mirrors, original air cleaner assembly, original ignition shielding, power steering, power brakes, power windows, Flowmaster mufflers, and much more. We changed the oil and filter, and checked and lubed the chassis. We also replaced the right front caliper and rebuilt the carburetor. It has always been garage-kept and well-maintained. It runs and drives very nicely. 1977 was the last year for the short back window generation in the C3 series. 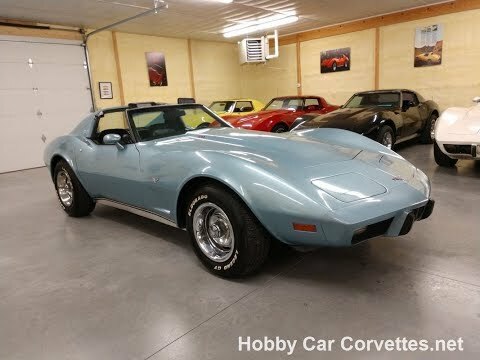 1977 was also the only year GM used this shade of light blue with only 5,967 released out of 49,213 total production that year. GM also only produced 7,982 with the 4 speed manual transmission in 1977. SOLD Check out the video! It has joined the hundreds of Corvettes we have sold locally and internationally.